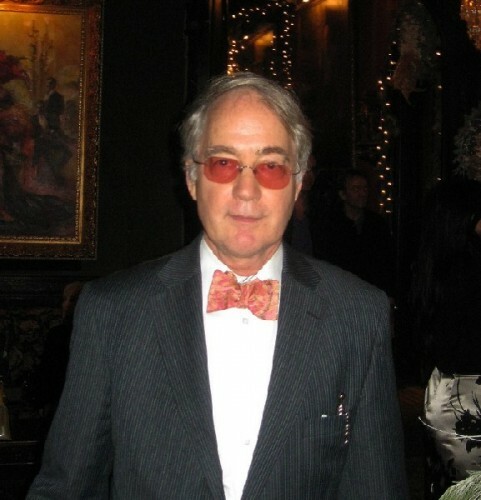 National Arts Club President O. Aldon James for twenty five years was noted for bow ties and pink glasses. For animal and bird lover James there were questions raised about all those dead finches in Gramercy Park. The club occupies the mansion of the former Governor Tilden. The ball room between exhibitions. 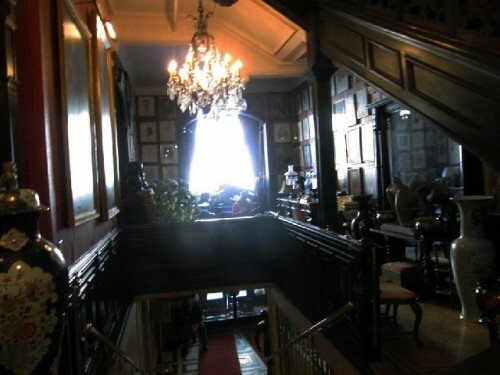 A balcony over the grand staircase. 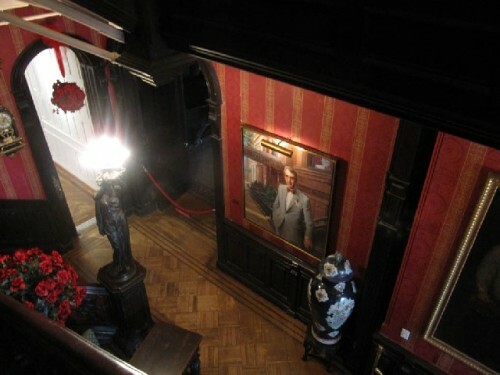 Looking down at a portrait of Aldon which enjoys pride of place. 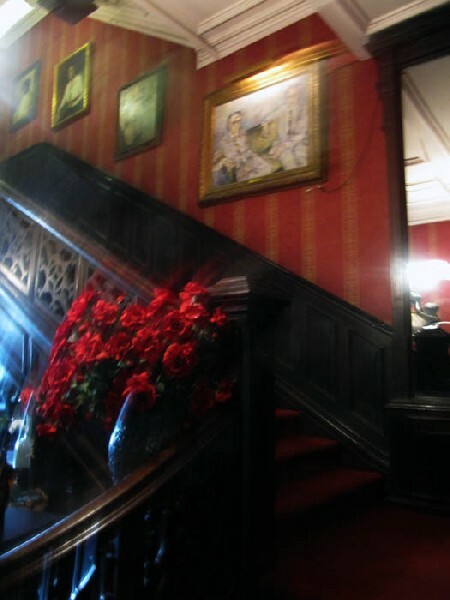 Prominently displayed above the stairs is another portrait of the James twins. 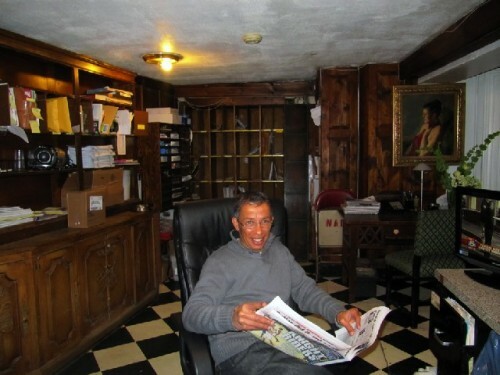 Miguel Serrano at his usual post in the now uncluttered reception area. Members are thrilled to see the popular Miguel back on the job. Arriving last week at the National Arts Club at Gramercy Park, our pied a terre in Manhattan, we were surprised and pleased to be greeted by the receptionist/ concierge, Miguel Serrano. 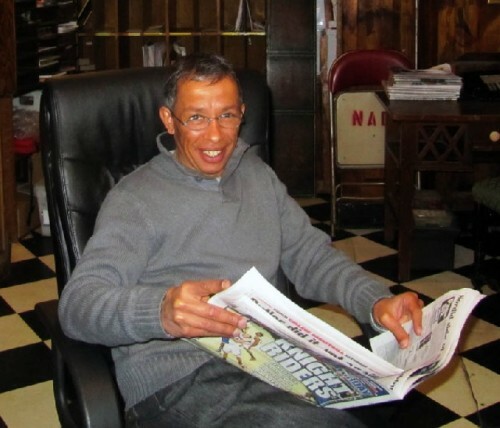 Among the many recent tabloid and internet news reports about the venerable landmark and its eccentric president, O. Aldon James, we read that he had been fired on December 17. Another employee was reported as sacked on Christmas Eve. For the past decade the diminutive, and gracious Serrano had been a fixture in the cluttered reception area and office next to the front entrance of the Calvert Vaux designed former Tilden Mansion at 15 Gramercy Park South. Governor Samuel J. Tilden ran for President of the United States in 1876. He won the popular vote but lost to Rutheford B. Hayes in the Electoral College. He died a bachelor a decade later in 1886. The mansion that Tilden built includes a grand ballroom and dining area noted for its mosaic glass ceiling designed by Louis Comfort Tiffany. 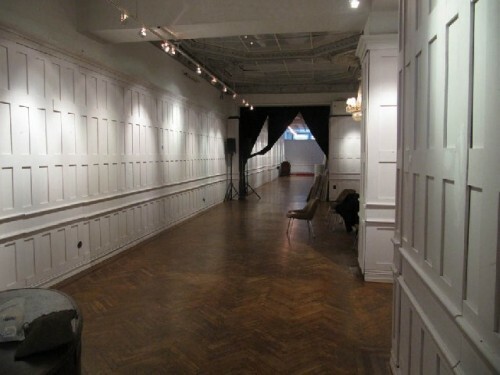 The traditional interior, that includes a collection of art by current and former members, has been used as a movie set and for fashion/ advertising shoots. 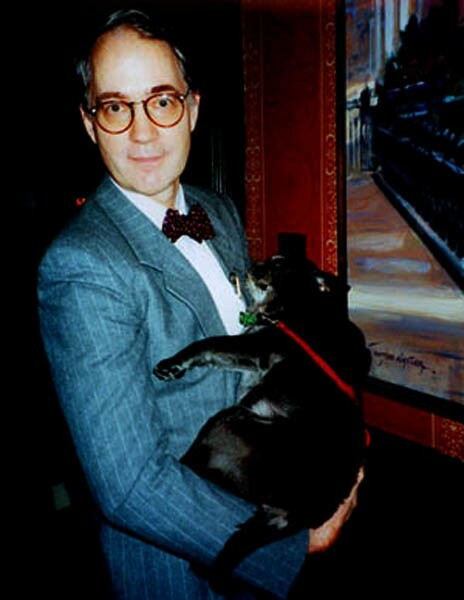 In the past 25 years under James the club has hosted many functions and awards dinners that have attracted New York’s most noted arts and political celebrities. The club is lively and popular and there always seems to be something going on including lectures, exhibitions, readings and screenings. The dining room is closed on weekends when the Club is booked for weddings and other social events. With an extensive and active membership, busy dining room, and weekend rentals for functions, many have questioned why the building is in such obvious need of repair. While the public areas of the club are maintained the areas for transient rooms, offices, studios, meeting rooms, and an attached building of residences are outmoded. While James draws no salary he and an inner circle of family, friends and trustees have enjoyed remarkable perks. John, the twin brother of James, who performs no administrative services for the club, rents an apartment for $356 a month. Tax filings from 2008-09 show that James' friend Steve Leitner, a real estate lawyer and board member, paid $858 a month for an apartment. Aldon James paid $1,143 a month, according to the filing. Three other trustees paid $7,600, $4,392 and $2,380 in monthly rent, according to records. 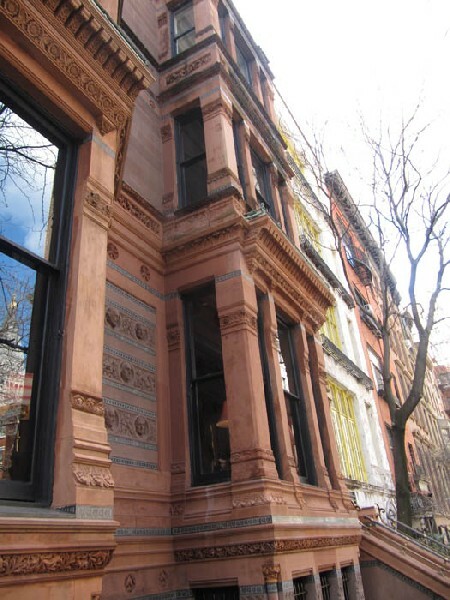 Those would appear to be cheap rentals for upscale Gramercy Park. An 800-square-foot two-bedroom apartment next door at 13 Gramercy Park South is on the market for $6,500 a month. In 1985, James fought tenants over rent-stabilization at the club, which resulted in the eviction of four elderly tenants. Seven other residents were later ousted for supporting rent stabilization, according to news reports. James has also been an activist intent on liberating access to and use of the private Gramercy Park which is available only to residents surrounding it. A recent incident, one of many, was reported in the Daily News. While sitting in the lounge last week we discussed changes at the club with a female member. She had recently returned to living in the city and applied for one of the apartments/ studios. There was no response and she wondered just how residencies were awarded to members. Before the holidays yet another scandal was reported on line. A former employee provided images of as many as ten spaces in the club used to store the flea market treasures of James and his friends. The clutter and poor condition of the rooms was alarming. This is valuable space earning no income for the club. A Jan. 7, 2010, inspection by the fire department resulted in a violation for obstructed exits and hallways. It is not clear whether inspectors had access to the cluttered rooms recently posted on the internet. Last week the elevator was often busy with workers carting off barrels and contractor trash bags. Apparently this has been an ongoing process since the “hiatus” of James was negotiated during an emergency meeting of the board as reported in the New York Times on March 15. We also noted members of the Fire Department in the building who may have been monitoring the progress of clearing the rooms in question. There have been ongoing struggles between James and many disgruntled members. There were previous attempts to gain access to membership lists and detailed accounts. When an attempt to oust James at an annual meeting failed a number of members resigned. Some joined the Players Club which is next to the National Arts Club. It has similar functions but does not have transient rooms or residences. In the past the clubs shared some privileges for members. While blog postings of clutter caused alarm it appears that another issue moved the board to action. There have been news reports that James managed to filibuster with a rambling three hour speech during an annual meeting. He hired security to remove anyone causing a disturbance. There were no reports of similar tactics during the recent emergency meeting. As the New York Times reported “Word of the change came eight days after dozens of baby finches were apparently abandoned in Gramercy Park, the two-acre oasis across from the club, and newspaper stories linked the president, O. Aldon James Jr., to the incident. “Dianne Bernhard, the acting president, said that the club’s board of governors was not happy about the publicity. But she said that the finches — apparently left in the park and endangered by a heavy rainstorm — were not the only reason that the board gathered for an emergency meeting on Monday night. During our week at the Club it was strangely quiet. Last Friday I was surprised when Aldon bolted past me head lowered. I was greeted by his friend Leitner. Returning from breakfast I discovered security posted all through the building. I asked one of these gentlemen what it was all about but didn’t get much of an answer. “I got the call for this job at 8:30 this morning” he said. Workers were removing boxes of documents from offices. While James no longer appears to be in charge we learned that the brothers and their friends continue to reside at the NAC. On April 3 the Daily News reported that Aldon resurfaced in the club's dining room to attend a dinner party. Security guards are now a fixture through the cub which is going through spring cleaning and inventory of its undocumented collection of works of art and archival materials. The NAC does not appear to have had a curator or conservator for the materials some of which may have been deaccessioned. Once again the office of the Attorney General is probing the financial records of the club and the unique perks, below market rentals and dining room privileges, of James, his twin brother, John, and their inner circle. A number of bird cages are gone from the public spaces including the now emptied and more spacious reception area. It was fun to experience the surprise of members seeing Miguel back on the job. There were embraces and hugs. Many asked, where have you been and what have you been doing? We will note with interest the changes that result as the club reorganizes. It is a truly remarkable and eccentric institution. It has endured a colorful and controversial chapter in its history. Oh if its walls could speak. What a great story. It would take Masterpiece Theatre to do it justice. "Giving slack to suspect behavior is a frequent subject these days. Great article. "